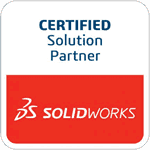 First, place your pointer over the SolidWorks logo until the File toolbar appears. Now, highlight the View drop down menu, and move your pointer down to the section of the menu that says Hide All Types. This is a list of items that can be hidden or shown in the graphics area. You can tell if an item is currently being shown by looking at the icon to the left. If it is depressed, then it is currently being shown. As you can see below, Sketches and All Annotations are currently visible in the graphics area. If you wanted to hide all the sketches in the graphics area, simply click Sketches and the icon will update. Now all the sketches will be hidden.